Now you can check out the public test realm for another Blizzard game - and it's Warcraft 3. We're used to seeing announcements for the Overwatch PTR, but how about a public test realm for another, slightly older game? Say, Warcraft 3, for example. That's what Blizzard revealed this week. Also of interest is the news that more updates are in the works. Stilwell writes that, "We are aware Warcraft III matchmaking is a bit long in the tusk; we will be improving matchmaker logic for a future patch." He also points out that automated tournaments and ladder boards are currently "not functional for PTR," and that while latency has improved with this new patch, it is "still needs work to meet modern standards." While it might be surprising to see a new PTR for a 15-year-old game, the more optimistic among us are likely hoping that this is the first step in a remaster plan similar to the one Blizzard is using for StarCraft. Maybe now they'll fix the missing building summoning animations. My Night Elf and Undead armies' buildings just materialize out of thin air whenever they're being built, and I can't figure out how to fix it. It drives me insane. Oh, it's the protoss beaming in the buildings. Hope that helps put your mind at ease. Anyway, I find it kind of ironic that StarCraft: Remastered is being released with practically the entire game and all its kinks intact (bar a Valkyrie firing bug), but Warcraft III, by virtue of not being South Korea's de facto religion, gets patch updates that alter the game's dynamic, however slightly. But, if it gets a remaster as well, not complaining. At worst, more people get exposed to Warcraft III. At best, Warcraft I/II get re-releases. 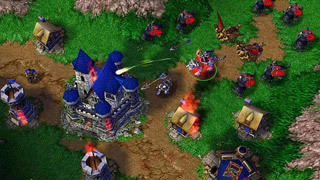 In fairyland, Warcraft III Remastered becomes so popular that we get Warcraft IV. So how long until microtransactions? Also, it probably wouldn't be that hard to recreate Warcraft 1 & 2 as custom campaigns in Warcraft 3. Those games were so darn simplistic it would be hard to screw up. There are just a few buildings, units, and spells that don't exist that would need art. Then the classics team would really be doing it.